Mentality of this Taxi Driver will definitely help you change your Mentality about girls! Sahil Tomar, a cab driver in Delhi had written this letter in 2016 and won hearts. Crime against woman is something which is integrating day after day, which is not a good sign for the nation. We raise an issue, sit with candles, protest for a few days and forget bout it ! Isn’t this what we do? This taxi driver has written an open letter for everybody. 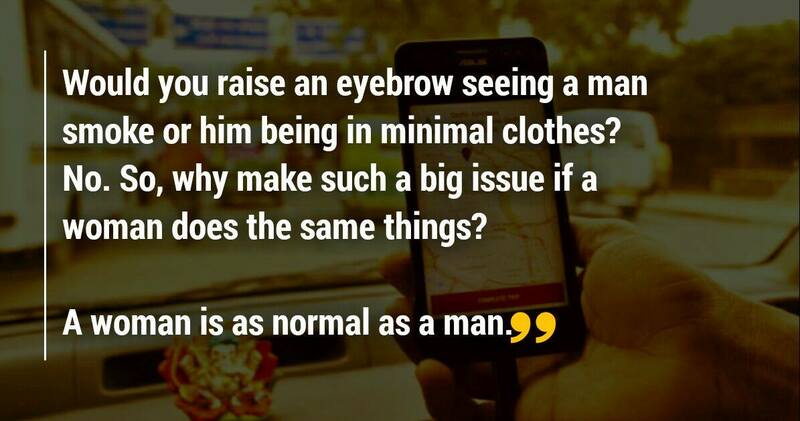 If a taxi driver can have such good thinking, then why can’t all the people in the society? This letter will for sure help everybody to embrace and upgrade such thinking! I am just a cab driver who neither has the education nor the life experience to preach or give lessons to anyone. But I do have a message, which I wish to send across through this letter. I came to Delhi almost a decade ago with dreams of improving my life. I was then a 22-year-old boy who had never stepped out of his village in Uttar Pradesh’s Faizabad district. My father, who was a farmer and a seasonal laborer, always stressed the importance of education and toiled hard to give the best possible opportunities to my three siblings and me. But, I was never good at studies. I failed my exams several times and repeated a few classes before I somehow managed to pass my class 10 board exams. After that, I tried my hand at several things — farming, mason work, sitting idle and ogling at women in the village. I was 20-years-old when I learned to drive and my father finally sent me to Delhi to find a job. Delhi, however, was not the city of my dreams. People would just walk past me and not notice me at all. From early morning to late night, women and men roamed around without any inhibitions. When I started driving in Delhi, I used to feel offended by how outspoken women in the city were. They would shout at me for missing a turn, and argue for change and call me tum and tu. I used to consider them ill-mannered and resent how their behavior was in total contrast to how things were back in my village. There, a boy and a girl still cannot walk together and women do not dare remove their ghunghat, let alone boss men around. I was scandalized and was hit by a huge culture shock in Delhi. Getting into fights with a man is different, but getting belittled by a woman seemed insulting. Sometimes during late-night pickups, female passengers wearing short clothes would get in my car and sit comfortably on the front seat. It used to make me uncomfortable. But that was the old me. As I grew in the city and gained some maturity, I gradually became broad minded. You get used to it also. Most importantly, I realized it’s not the women who need to change. It’s me who had to. I had to let go of my shallow thinking. I found a trick to adjust to this modern environment that I would like to share with my brothers. Think of it this way – would you feel awkward if a man sat comfortably on the front seat and talked to you? Would you raise an eyebrow, seeing a man smoke or him being in minimal clothes? No. So, why make such a big issue if a woman does the same things? A woman is as normal as a man. The situation has gotten worse for us ever since a cab driver raped a female passenger sometime at the end of 2014. I do not disagree that some drivers who have just come from villages and have not seen modernity would get excited and do gandi harkat (bad things) with women. But I plead, not every driver is the same as that culprit. I am not that type, for sure. I want to tell my fellow cab drivers that our job is not only about dropping people to their destination and earning money. Each time we get a new booking from a customer, that person – be it a man or woman – signs an unwritten pact of safety and security with us. And we must be fully conscious of this and behave accordingly to set the right example. We have to win the faith of our passengers, especially the women who are so scared of us these days that they click pictures of our car and ourselves to share with their families for safety purposes. As drivers, we must behave like ‘guardians’ of the roads – dropping a woman to her house or where ever she is headed to. Every journey that we safely complete is a badge of honor that we take back home to our families with a smile. This letter is a source of motivation for every other individual. We are living in the 21st century and it is vital that we all share the same rights and independence! Share this noble message as much as you can and support it!